Any brunch worthy of the name has at least one (if not several) eggs Benedict on the menu. To stick with a laid-back attitude, a combo of eggs Benedict and childhood favorite, eggs in a basket, come together in these Benedict Baskets. English muffins stand in for plain bread slices and keep with the Benedict theme going. (Though if you prefer toast you can just as easily substitute any sliced bread of your choice.) All the elements of eggs Benedict are here, they’re just made over to make things easier and quicker for you for a lazy brunch morning. Preheat oven to 350°; coat a jumbo muffin pan with nonstick spray. Roll 6 muffin halves a bit larger using a rolling pin to flatten. Place a muffin half in each well, pressing up the sides to form the baskets. Combine melted butter and mustard, then brush onto the baskets. Toast baskets in oven until slightly browned, about 15 minutes. Sweat onion and garlic in oil in a sauté pan over medium-low heat until softened, about 5 minutes. Add spinach and cook until just starting to wilt; stir in tomato. Off heat, season spinach mixture with salt and pepper. Place one egg into each basket. Divide spinach mixture and cheese among baskets. Bake baskets 15 minutes. 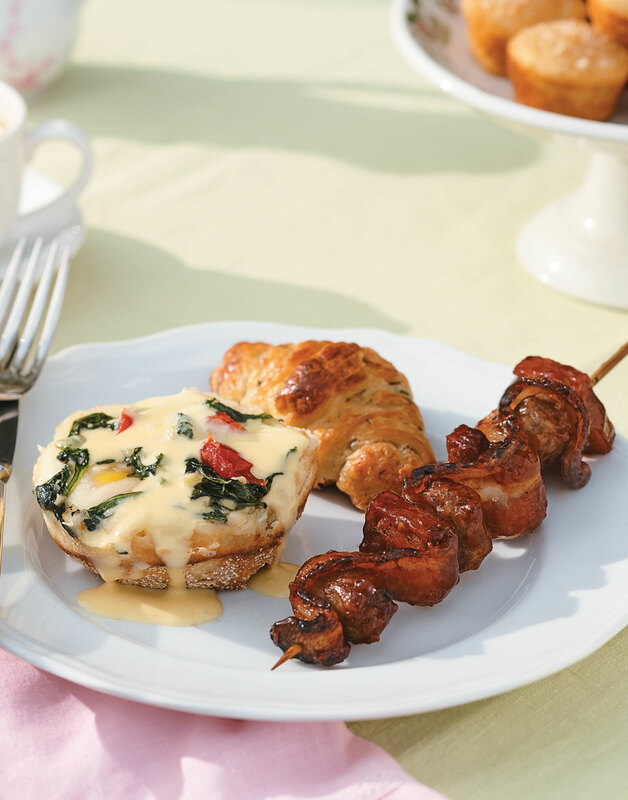 Lift baskets from pan wells; serve immediately topped with Classic Hollandaise sauce. Rolling the muffins makes them larger and easier to mold into the muffin pan without breaking apart. When the muffins are hot from the oven, add the eggs to the "baskets" so the eggs start cooking instantly. Layer the eggs, then the cheese, and end with the spinach-tomato mixture and return to the oven.